Driving 10,000 miles from Goodwood to Mongolia this summer, Plug In Adventures was born from a passion for adventure and electric vehicles, with the aim to engage the public in all things EV-related. Dubbed the LEAF AT-EV (All Terrain Electric Vehicle), the vehicle is based on a standard 30kWh Nissan LEAF Acenta, which offers a range of up to 155 miles on a single charge. Key modifications have been made to better equip the car once it reaches the more remote parts of the journey. Speedline SL2 Marmora wheels and Maxsport RB3 narrow tyres have been fitted for better performance on unsealed roads. Welded plates to the underside of the wishbones, braided brake lines, mudflaps and a 6mm aluminium sump guard add further protection from rough terrain. The interior modifications have been focused on reducing weight and providing more storage space. The driver and front passenger area is unmodified apart from the addition of rubber floor mats. The rear row of seats and rear seatbelts have been completely removed, contributing to a 32kg weight loss. A Fire Extinguisher and Medi Kit have also been integrated into the boot space. 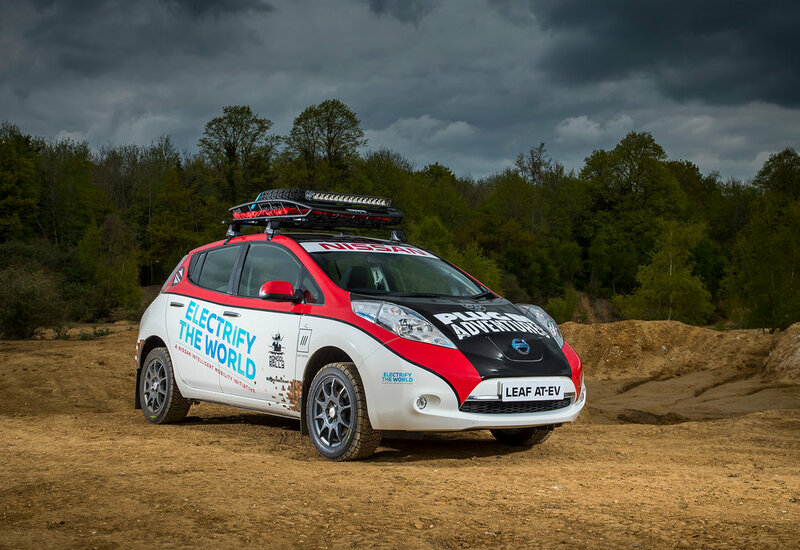 Chris Ramsey, founder of Plug In Adventures, said: “The Mongol Rally is our most challenging electric vehicle drive to date, but it’s one we’ve been planning for a number of years. Not only will we face a dwindling number of EV chargers the further east we go, the terrain also becomes more difficult to navigate." The LEAF will accept a 240v ‘Commando connection’ even in the most remote areas when fast-charging is no longer an option. Ramsey plans to make regular stops along the way to promote the benefits of running an all-electric vehicle to residents of the countries he’s passing through. He’ll also be using the What3Words platform to log the locations of some of the uncharted charging network, so that future EV drivers traversing the region can benefit from accurate charging point locations. The Mongol Rally gets underway on the 16 July.